On Saturday I visited a few garage sales and the thrift store and managed to collect some more cotton clothing in darker shades of pink. This piece is my favorite from this group of clothing; I love how dark and rich the colors are. Next week my rotary cutter will be getting a workout as I begin to cut the clothes into strips; lots and lots of strips! 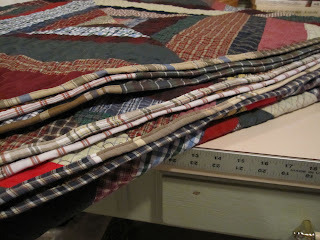 I have been searching blogs for project ideas for one of the sewing classes I am currently teaching. This class consists of older kids which is nice because they catch on quickly but on the other hand, because they sew fast, I am quickly running out of ideas. On the blog Retro Mama I saw a cute patchwork plastic bag holder which I knew would be a great class project. After digging through some of my fabric scraps here is my version of a patchwork bag holder. And easily close once filled. The bottom opening has elastic so the plastic bags will pull out with ease. I am very pleased with this patchwork bag and I think the kids will like making one too. Yesterday I took my favorite chocolate chip cookie recipe, found on the back of the Nestle's bag, and made some substitutes; white chocolate instead of semi-sweet and macadamia nuts instead of pecans. The end result was amazing! Although the cookies are wonderful I will not be making them very often for two reasons. The first reason has to do with the nuts, they are 16-dollars a pound! And the second reason is the cookie itself; while the taste is incredible the cookie is too rich. Here is the beginning of Elizabeth's quilt; assorted pink clothing just washed and blowing in the wind. This is my favorite fabric so far. I still need to find a few more darker pinks before starting; it's been a challenge to find pink clothing not made from knit fabric. At the beginning of the month I read about a big "Fall into Fall" giveaway. At once I was interested; if I was ever going to win a giveaway this was probably my chance. With almost 150 blogs participating it took me the weekend to visit them all. I left comments on approximately 125 of the blogs; some blogs offered things I would not use so I decided not to enter all the giveaways. By the end of the weekend my eyes were tired from reading so much but I gained some nice ideas and a few new blogs to read and my efforts were rewarded; on the 15th I was contacted by Clover and Violet as a winner! My prize was a pattern for a purse and the fabrics needed for the project. I remember, many years ago, trying to make yeast doughnuts but I do not remember how they turned out. Most of the time when I make doughnuts I use canned biscuits but I wanted to make a doughnut that tasted similar to a bakery doughnut. So, using my recipe for white bread I gave it a try; and boy was it a success! The doughnuts turned out soft, warm and so very good. I am looking forward to making these again and trying them with a powdered sugar icing and perhaps a chocolate icing. Today I found a vintage doll at the thrift store for $1.50; she is a ballerina and exactly like the doll my sister had growing up. Her leg joints are a little odd but the legs still move. She has what looks like her original ballet shoes. Her hair is surprisingly in good shape. After a good bath and some new clothes I believe she will be a keeper. It's amazing what can be done with simple bread dough. Roll it thin and give it a little twist; Bake until brown and crispy for the most fantastic bread sticks ever! I love how Elizabeth looks like she is playing an instrument in this photo; playing with food is too fun. With this same bread dough roll thin, spread with melted butter and sprinkle on some cinnamon sugar. Cut into wedges and add to a pan that is covered in melted butter, brown sugar and pecans. With the leftover bread dough simply roll and shape into a log. Goodness, three yummy foods from one batch of amazing bread dough. Over the weekend we butchered the remaining roosters; it always feels good to get this job completed. Have you ever wondered what happens to the blood, guts and feathers? We burn them! This step always makes me want to bar-b-que. For some time now I have wanted to make an apple pincushion; after a quick google search I found this photo tutorial and decided to give it a try. I first began with a pretty apple. And then cut into thirds. Next I took one section and cutout the apple leaving just the skin. Now I needed some thin cardboard and settled on this cracker box. Now I took a ruler and marked 1/8 of an inch on the outside of my pattern for the seam allowance. Now I have a perfect template. Using my template I placed it on the wrong size of my fabric, marked it with a pencil and cutout my sections. My apple took 6-sections in all. Next I stitch each section leaving an opening for turning. Once turned I stuffed with Polyfil. I had trouble with my apple falling over so I added a button at the bottom and one at the top, inserted embroidery floss and tied it snug. This brought the bottom in just enough so my apple would sit flat. The final step was adding a leaf. My apple tilts slightly to one side but I am pleased with how it turned out. Yesterday I wanted to make some bread for breakfast but I only had one banana and my recipe calls for three. Hummm, what to do? I added a large apple, cut into small pieces, and it was the best bread ever! One of our local quilt shops recently had a "Going Out of Business" sale. While browsing through the fabrics I came across a bag of scraps priced at 5-dollars. The bag was filled with wonderful assorted fabric in a variety of sizes. Elizabeth sorted the fabric for me setting aside the larger pieces from the smaller pieces. As I was sorting through some of the smaller pieces I decided there were enough small pieces to make a toddler size crazy quilt. 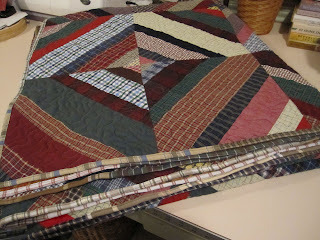 I love the scrappy look of crazy quilts. Working on these blocks should keep me busy while I begin looking for and collecting pink cotton clothing for Elizabeth's quilt. I have now fully completed the king quilt and it feels wonderful. For the binding I used more strips from shirts and stitched them together in a mixed matched fashion so when it was stitched on the binding became some what variegated. While quilting I used one full cone of thread and the start of a second cone; each cone has 3000 yards of thread and this doesn't count all the thread used for stitching the strips together in the beginning. When I first started this project I had hoped to spend $25 or less on all my supplies; but I went over budget. The shirts alone ran $26 plus $3 for the sheets, and an undetermined amount for the thread and the batting. I was originally planning to use warm and natural cotton batting but at the last minute I decided to use up some poly batting that I have had for several years in the top of the closet. My next quilt project will be for Elizabeth. The request was made a couple of weeks ago for one made from pink fabrics. Oh how she loves pink!